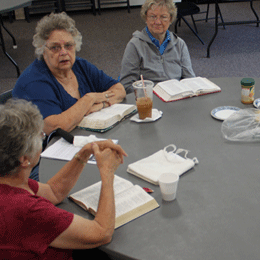 A lunch-and-learn Bible study is held on Thursdays, starting at 12:30, at the church. An extra session, covering the same material, is held on Tuesdays at 1:00 pm at The Carolton Chronic & Convalescent Hospital in Fairfield. Participants are invited to bring their own lunch, while having their spirits fed through God’s Word. Bibles are supplied. The sessions, from September through May, are led by Pastor Mark Christoffersen. Studies typically focus on particular books of the Bible and last for several weeks. Please join us at any time; no previous Bible knowledge is necessary. For more information, contact Pastor Mark Christoffersen. The church office is open from 9am - 2pm, Monday through Friday.